In response, the neighborhoods collaborated to form the Pontilly Disaster Collaborative (PDC) that seeks solutions to localized flooding issues caused by rainfall events. PDC approached the New Orleans Redevelopment Authority (NORA), who had received ownership of many residential properties in Pontilly following Katrina, to utilize vacant lots for managing stormwater. A landscape architect at NORA recognized the value of the community organization’s idea and began seeking funding through the FEMA Hazard Mitigation Grant Program (HMGP). The Pontilly Hazard Mitigation Project is funded through FEMA’s Hazard Mitigation Grant Program. 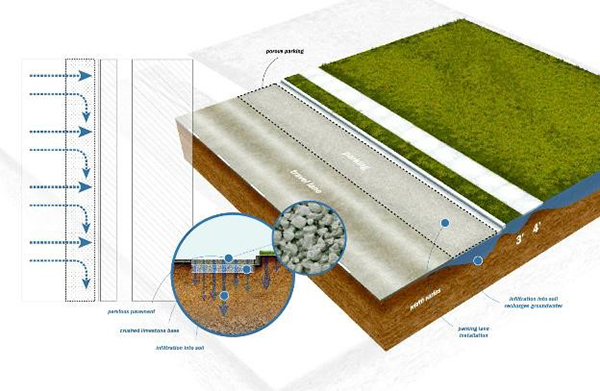 It took enormous efforts by the NORA landscape architect and a FEMA representative to convince FEMA funders that green infrastructure should be constructed, not the administration’s standard catch basins, pipes, and canals. These women’s insistence on a higher standard The insistence by these women to set a higher standard resulted in the first FEMA project to employ green infrastructure as mitigation. NORA was awarded $15M for design and construction of this project. Winners of the project include the engineering company CDM Smith serving as lead consultant with landscape architects Dana Brown & Associates (DBA) as sub-consultant. 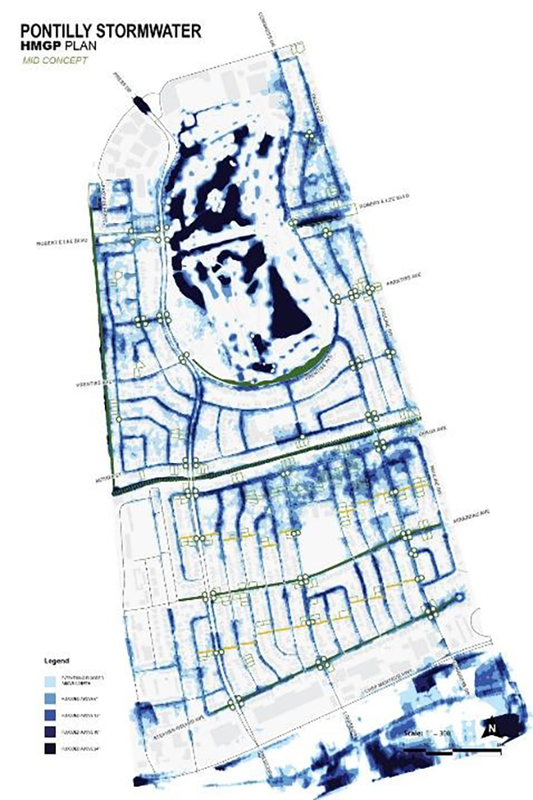 The project team analyzed the land cover, topography, and drainage system; modeled hydrologic and hydraulic processes; and designed stormwater management system alternatives to manage rainwater as close as possible to where it falls. 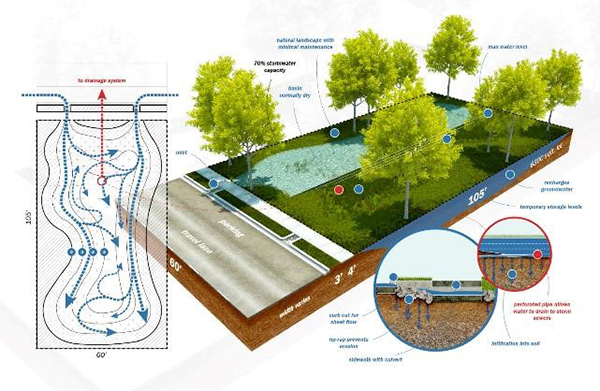 This approach called for a distributed but connected series of green infrastructure facilities that detain, filter, and infiltrate stormwater runoff. The alternatives were evaluated for efficacy of flood risk reduction as well as providing many other benefits. HMGP funding requires proof through modeling that the economic value of benefits would equal or exceed the level of grant funding, which was provided through benefit-cost analysis (BCA). The HMGP grant is currently funding $13.5 M in construction of stormwater management interventions as retrofits in these older neighborhoods. Issues addressed include heavy clay soils, severe soil subsidence, and drainage pipes and pumps taxed beyond their capacity. 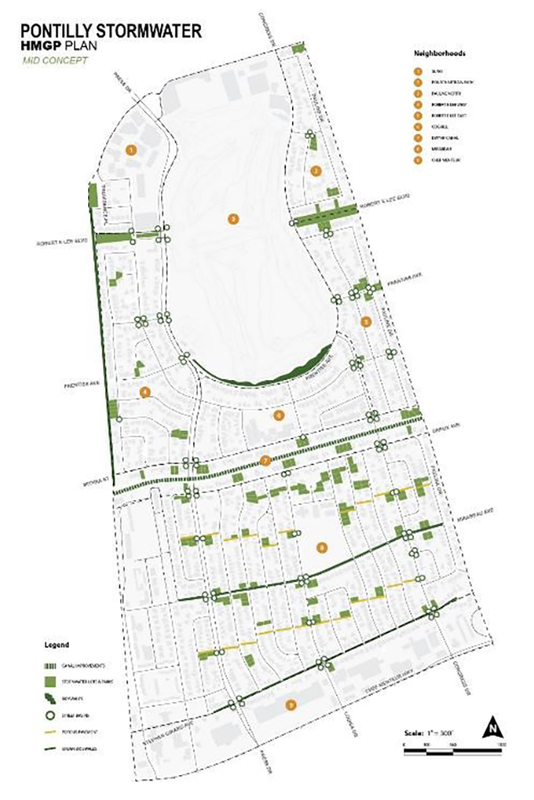 Working with CDM Smith water resource engineers, DBA designed stormwater detention areas on residential lots on which owners did not want to rebuild, creating small open space areas known as stormwater parks. 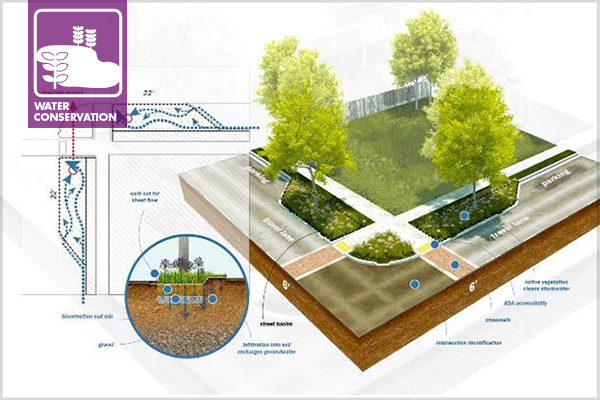 Bioretention cells at intersections in curb extensions, also known as street basins, and urban bioswales between curbs and sidewalks are being constructed. Parallel parking lanes on key streets are also being reconstructed with pervious pavers. Models show significant reductions in flood water levels and in the number of properties potentially damaged. The BCA captured the value of air quality improvement, water quality improvement, and forthcoming tangible benefits such as strengthening of the social community, reduced air temperatures, and improved neighborhood walkability. Dana Brown is a native of New Orleans, and has worked tirelessly to address the U.S. Environmental Protection Agency and Louisiana Department of Environment Quality requirements for water quality. She has written and revised chapters of the development code for several municipalities and parishes. She authored a manual to guide developers and design professionals in designing and implementing stormwater best management practices and organizes and leads dozens of stormwater workshops each year. Ms Brown, thank you for contributing this article. I have found that working on water quality issues, is not just a career, it is a mission. The information is clear, concise and has beautiful visuals. My question is about the graphics, can you please share what software you use to produce the graphics? And again, I thank you for all your efforts.